Day 12 is finally here! 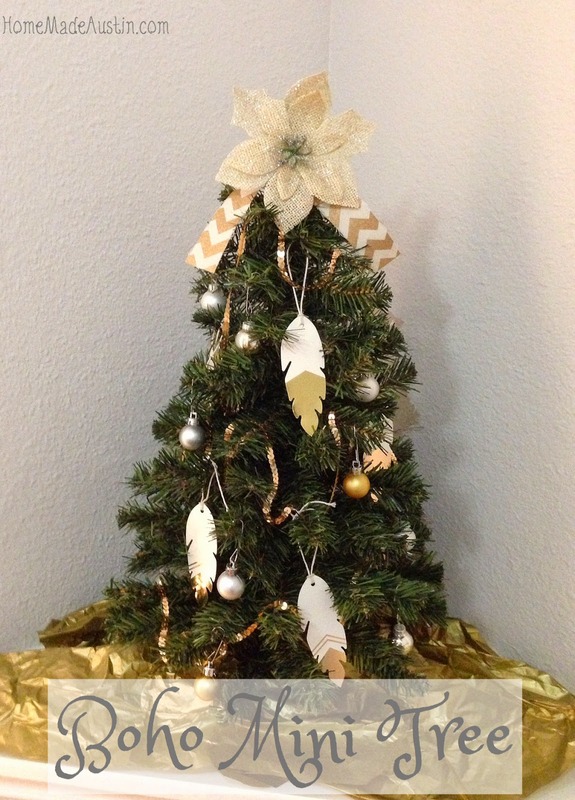 I've had a blast showing you some of my holiday ideas for 2014. Hopefully I've inspired you to make you home a little brighter, you meals a little festive & your holiday season a little merrier. Today's DIY project is so pretty & comes together in a snap, with a few items you can find just about anywhere this time of year. 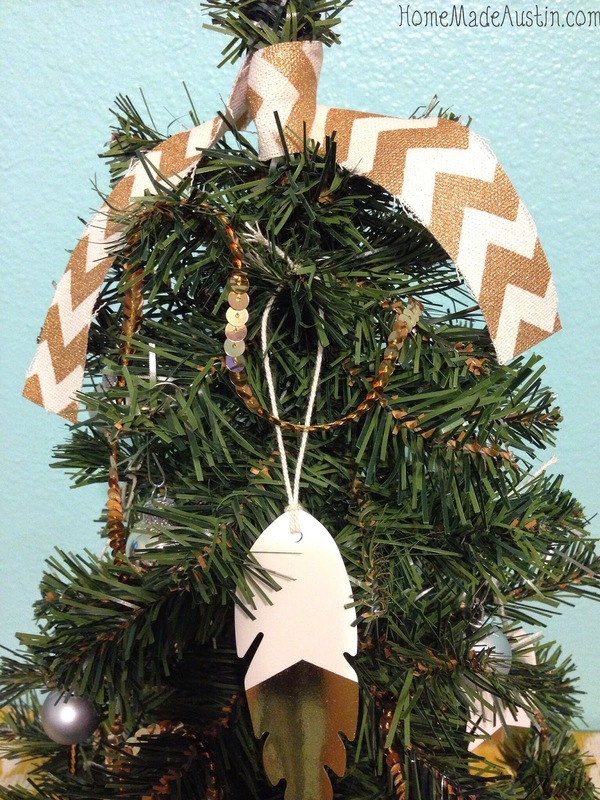 It's a mini tree with a 'boho' twist. I've been all about the metallics this season & wanted to do something with those colors for the nook in my upstairs hallway. 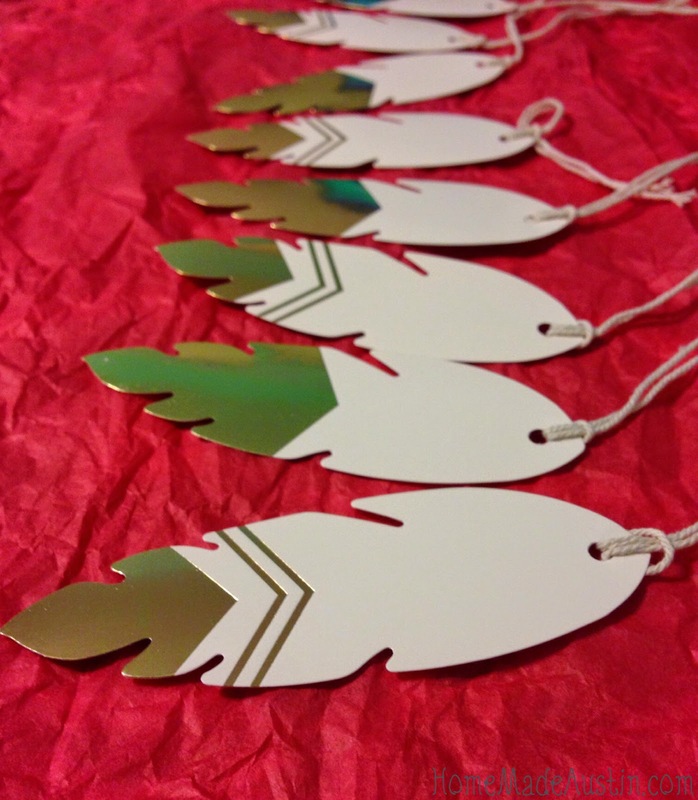 On a trip to Target, I spied these white & gold feather gift tags in the Dollar Spot & an idea was born. 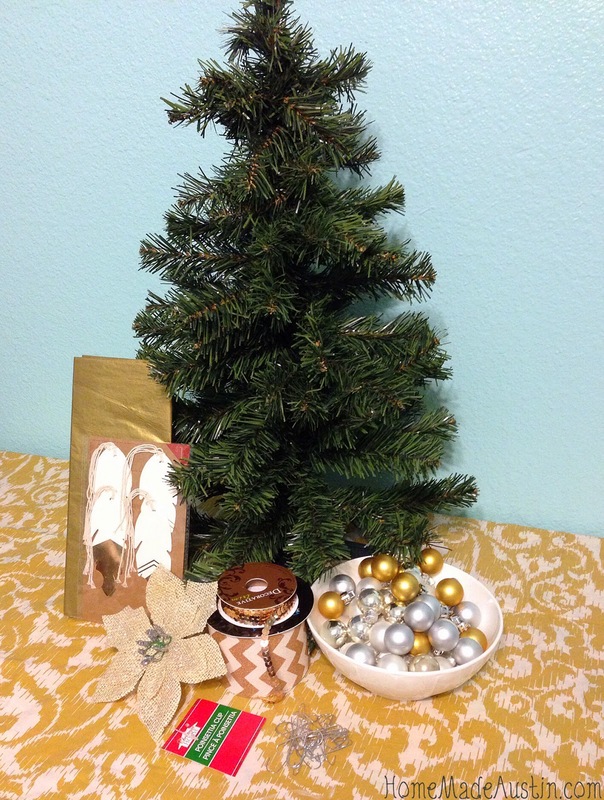 A bohemian inspired mini tree was just what I needed to make the corner shelf sparkle. I love how it turned out. I think it's a little traditional, with some fun, funky vibes mixed in. And I think I got just about every metallic color I have on there. Happy girl right here. The supplies for this one is easy & super affordable. 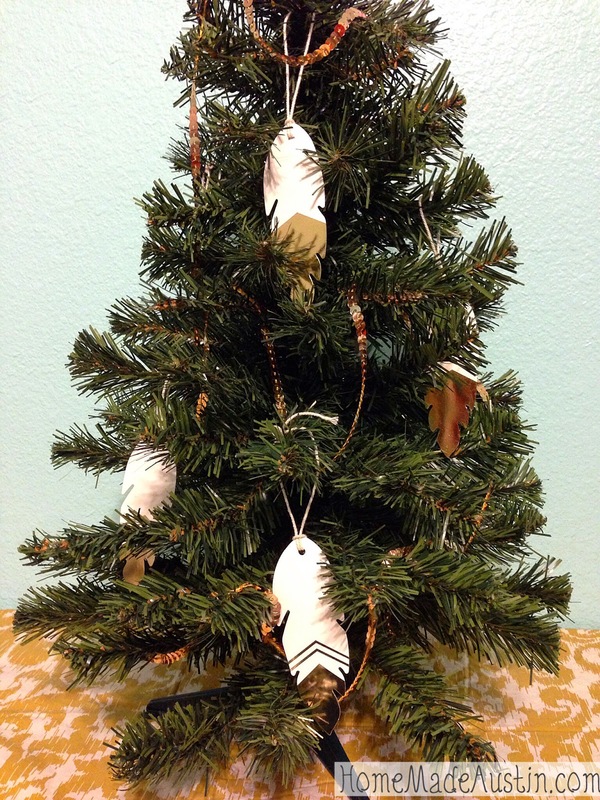 The tree is from a local grocery store & cost a measly $5. 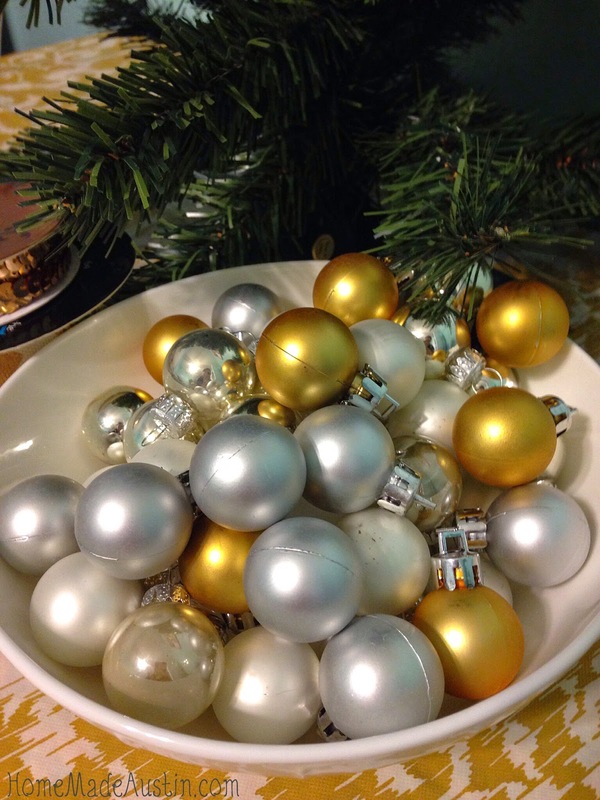 The mini gold, silver & white ornaments where clearance finds from last year. The sequin ribbon was a score I found at a craft store several months ago & have been saving for a special occasion. Same thing with the gold chevron. I love both & have been dying to use them. The feathers are actually gift tags from Target's Dollar Spot. 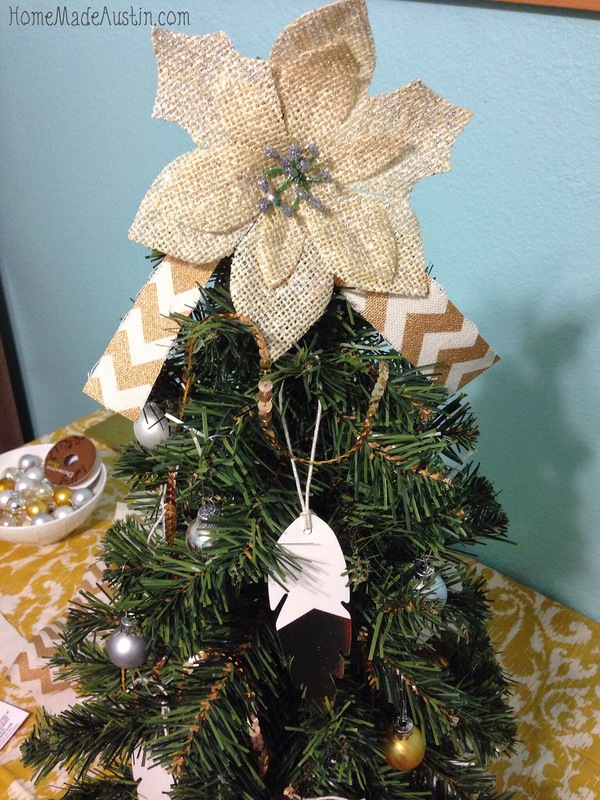 The cute burlap & silver poinsettia is from Dollar Tree. 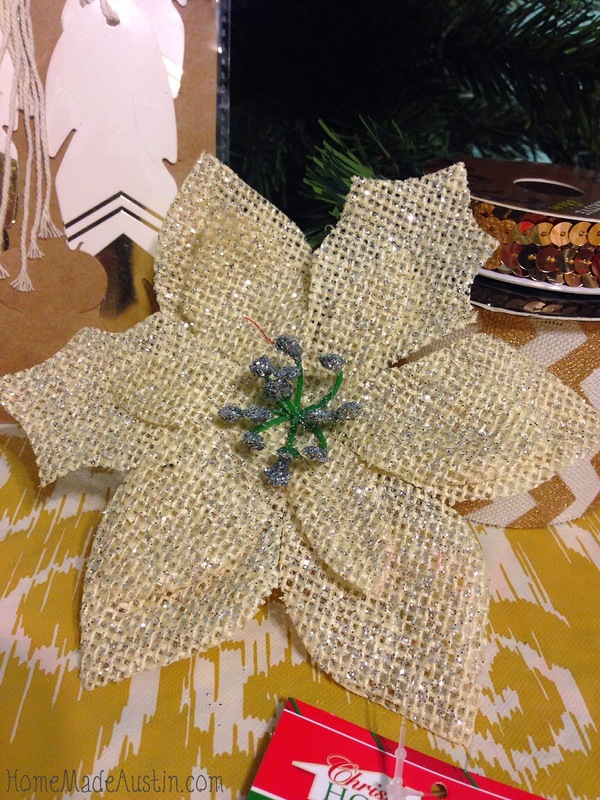 The gold tissue paper is from my gift wrapping stash, but it's easily available at most stores. And the ornament hangers are from who knows when....I feel like they're the poultry seasoning of Christmas....I buy a new pack of hangers every year because I am always afraid I don't have any left. 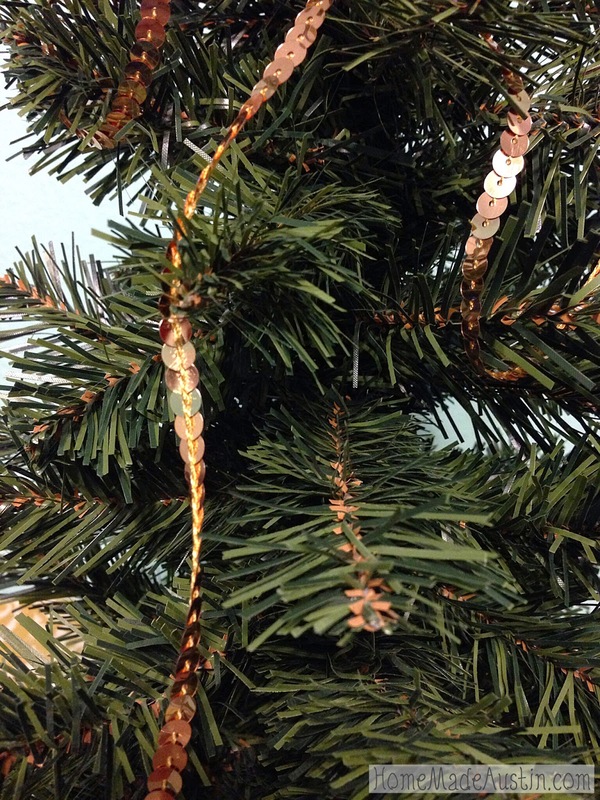 To start, string those beautiful rose gold sequin strings throughout the tree. 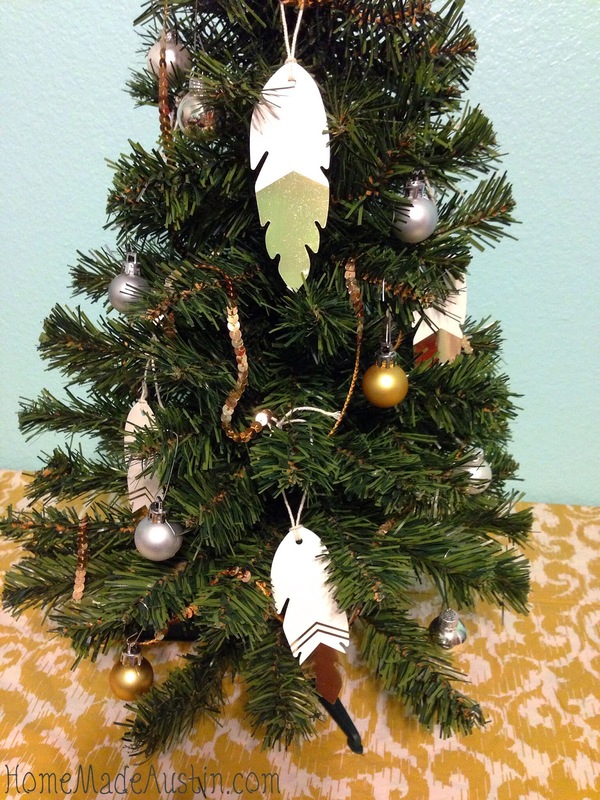 Then add a few of the white & gold feather tags. So pretty! Some shiny white, gold & silver teeny, tiny ornaments. 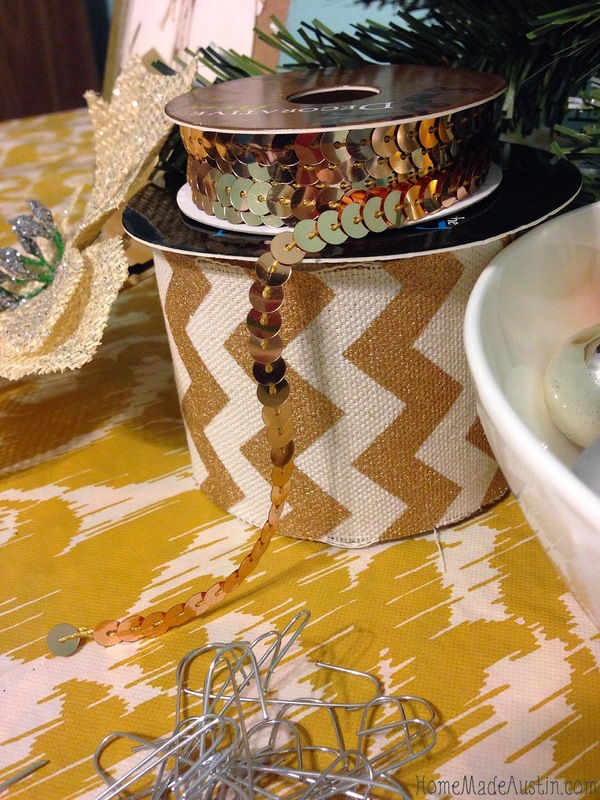 Tie a piece of the copper chevron ribbon around the top. Place the burlap & silver poinsettia just right at the top. 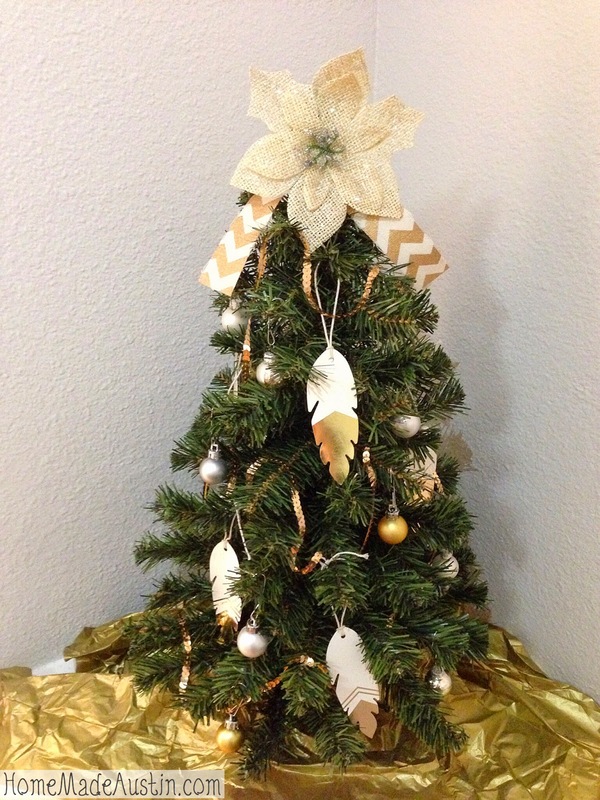 Nestle in a piece or two of shiny gold tissue paper around the bottom & admire your chic new Christmas tree! Thanks Kaylin! Yes, I did participate....wasn't it so fun? 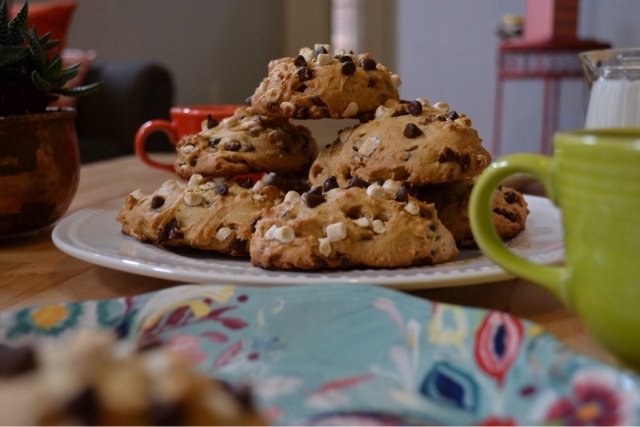 I'll definitely be checking out everyone's recipes today...I've actually held off on making my cookie baking list for Christmas until today! That's awesome that you're visiting Austin for New Year's....it's a great town to celebrate in! And Congrats on moving in with your bf, that's so exciting! 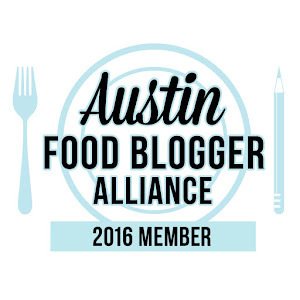 Austin is definitely a wonderful place to live. I'll try to write a few 'off the beaten path' places to check out & email them to you!